Repo Men (2010) Movie | You. Upgraded. Based on The Repossession Mambo novel by Eric Garcia, Repo Men is a science fiction action film that stars Jude Law, Forest Whitaker and Liev Schreiber. Directed by Miguel Sapochnik, the film originally had an April 2, 2010 US and Canada release but was moved up to March 19, 2010. In 2025, humans now enjoy an improved and lengthier life thanks to a corporation called The Union. This company provides bio-mechanical organs to humans on credit. While it all looks good, there’s a darker side to this corporation. When you can’t pay your bills, repo men will hunt you down and take away the organ none too kindly. Trouble comes when Remy, one of the repo men, collapsed due to cardiac failure only to wake up with a brand new heart that costs an arm and a leg. When he fails to make payment, The Union sends Jake, one of the Union’s toughest repo men and Jake’s partner. The year is 2025, and The Union has come up with the perfect replacement of organ transplants -biomechanical organs. While these can be obtained through credit, it comes at a very steep price and an even steeper interest. But The Union’ most disturbing practice comes when you’re unable to meet payments. Employed by The Union are repo men who hunt you down and harvest back the organ when you fail to pay for three consecutive months. And it can be quite messy, leaving the customer dead most of the time. Remy is one of The Union’s repo men, one of the best. Together with his childhood friend, Jake, they both make a great tandem. However, Remy’s profession remains a sour issue for his wife. She eventually leaves him, and he decides to quit his job. On his last assignment as a repo man though, tragedy strikes. While on a repossession job, he uses a heart defibrillator to take a customer’s mechanical heart back, but the machine malfunctions, electrocuting him. His heart is severely damaged, and in his weak state, he has to choose – an artificial heart or death. Left with no option, he chooses the former. Remy recovers, but is unable to perform his job as a repo man. He works as a sales agent, but realizes that it’s not enough to cover his payments. Jake comes to the rescue by taking him to a secluded nest where other people are avoiding repossession. There Remy meets Beth, a fellow repo who is suffering from drug addiction. The pair live together with Remy writing a biography, but their relatively peaceful life was disturbed when a repo man attempted to take Remy’s heart. They somehow escape only to be apprehended at the airport. They escape airport security, and head to a black market doctor to replace Beth’s knee. There they are apprehended by Jake, who is now the assigned repo man to Remy. The former confessed he rigged the defibrillator to force Remy to stay as a repo man. This confession ensues into a fight with Remy knocked unconscious when his head hit a steel chain and hook. They somehow escape again through the help of an underground group of refugees, and Remy vows to destroy the Corporation. They were able to gain entry into The Union and plan to destroy the system only to realize that the way to do it is to remove their organs, which they proceeded to do. Jake and Frank, his boss, enters the room where the system is and finds Remy trying to resuscitate Beth who stopped breathing. As Frank pulls a gun to kill Remy, Jake stabs him instead. They destroy The Union by detonating a bomb. The next scene opens with Remy and Beth lounging at the beach with Jake. All is well as Remy looks at Jake, but only that the background fades and voices can be heard. As it turned out, Remy suffered a massive head injury from his scuffle with Jake, and is on a Neural Network machine; hence, he lives in a make-believe world. Generally, the film received negative reviews from both critics and viewers. In the box office, it earned a total of $18,409,891 on a $32M budget and was included in the list of Biggest Box Office Flops of 2010. Would Repo Men Make for an Entertaining NetEnt Slot? The 2010 action thriller Repo Men is one of those films that really make you stop and think about the future and the society we live in. Although focused on the action and excitement, Repo Men does have a powerful underlying message about the worth of human life and the power of those who have a control over it. 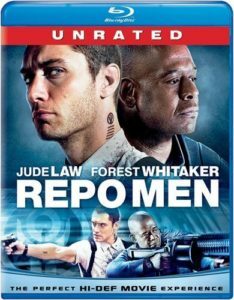 However, the intriguing underlying story and the cast that included Jude Law, Forest Whitaker, and Live Schreiber weren’t enough to make Repo Men the success it could have been. The general feeling was that the promising story was sidelined in by gore and bad screenplay, resulting in Repo Men never achieving its claim to fame, despite a great promise. 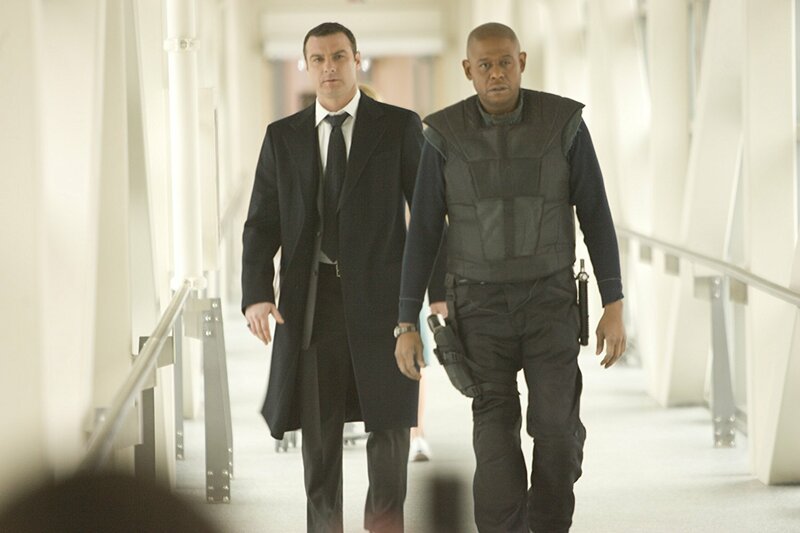 Repo Men Take Two: Casino Slot Instead of a Remake? In case you haven’t had a chance to see the film, the plot revolves around an organization known as The Union, which sells bio-mechanical organs. Thanks to these, human life expectancy is seriously improved, but this comes at a price. Organs are sold on credit, and those who default on their payments are visited by The Union agents who reclaim the organization’s property. After having a biomechanical heart implanted, one of the organization’s best reclaiming agents, Remy, loses the taste for his job, which serves as the catalyst for the action. The problem with the movie is that it focuses too much on the action instead of the story, which makes it another action-packed flick instead of a memorable cinematic title. One way to rectify this and restate the message of Repo Men would be through a casino slot. Although this may sound strange at first, the trend of creating slots based on movie titles has been very present among developers such as NetEnt. One of their more recent releases saw them create a game based on the popular Planet of the Apes franchise, and that one was a great success. We’d definitely like see them take on Repo Men as well, partly because numerous online casinos give out free spins on new NetEnt slots. Could a Slot Tell a Better Story? One question worth asking is, if the film didn’t manage to properly tell the story, would the Repo Men slot do a better job of it. After all, slots are limited in many aspects and don’t have nearly as many tools at their disposal. However, NetEnt developers are masters of their trade and if they set their mind to it, they could certainly make the game focus on the story. They could use some truly memorable scenes and dialogues and even take some artistic freedom to put a bigger emphasis on the plot. It is hard to say whether or not this will happen and if we’ll actually see the Repo Men slot on virtual shelves of online casinos. Whatever happens, the fact remains that the whole idea of the movie had so much more offer that it would be a real shame if someone didn’t step up and gave it another try.